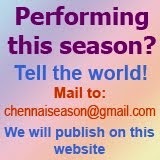 Chennai December Season 2018: Sparkle Dazzle Electric ! What is the human emotion after witnessing and being through a torrential downpour for three hours at a stretch? What is the feeling when you watch a half hour cracker bursting session? What happens when you are on a zig zag roller coaster ride? A sense of awe and bewilderment ! One is stupefied and also maybe a trifle shaken! Sense of sparkle and dazzle! High spirited adventure trip? These are exactly what we could describe of Abhishek Raghuram's concert last evening at the Music Academy. Unbridled imagination translated into torrential spells of raga and swara phrases. Unstoppable brikhas catching up with one another left one stupefied! To such an extent, that even the mangalam 'pavamaana suthudu pattu ' was not spared ! 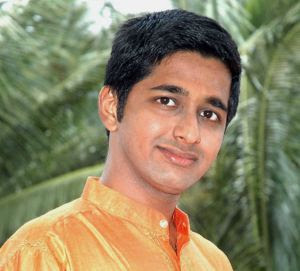 Abhishek is blessed with a voice that can traverse easily and an imagination that charters unchartered territories. The Vasantabhairavi followed by Needaya Ra dhaa and the Kalyani followed by RTP - un darisanam kidaikumo nataraja dayanidhe, set in chatusra triputa, atheetha eduppu, witnessed all of that which has been said above. Its amazing to see this young lad being gifted with so much of the musical sense that can be translated much beyond an average thought process. However as in the Kalyani raga, there were more of flashes upon flashes, with little of Kalyani to soak into.At times when he used to land on a traditional phrase format, one heaved a sigh of relief as though one has landed from a roller coaster, only to be lifted into a zig zag again ! As time goes by , without getting too lost into the mechanics of the swaras , if Abhishek lost himself in the ruchi or the flavour of music along with his sparkling imagination, one would see a stupendous artiste non-pareil, blooming prettily for posterity. Akkarai Subbhalakshmi, is one violinist who has by now demonstrated as to how to maintain fidelity to the main artiste. Her violin transforms into that style and the effect of the concert just multiplies. Kudos to her on her ability to match Abhishek phrase after phrase. Neyveli Narayanan, needs no introduction. A thoroughbred professional he led the show with equal gusto, ably supported by Guruprasanna on the Khanjira. I've been reading some of the reviews on this site and my feeling is that many of them are offering opinions instead of a review of the cutcheri. I would like to take this review of Abhishek's cutcheri as a case in point to illustrate. Up until the paragraph that begins with the word Abhishek, you offer subjective observations to which I, as the reader, can attach any emotion I wish. You then make a statement about Abhishek's capability; "Abhishek is blessed with a voice that can traverse easily and an imagination that charters unchartered territories" and then offer no reason why I as a reader should believe that. In the next paragraph you believe Abhishek obscured Kalyani with his flashes. How did he do it? 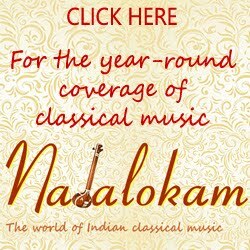 What is the essence of Kalyani and which note structures and combinations thereof made you believe " with little of Kalyani to soak into?" Your next paragraph then offers advice, again with no details, on how Abhishek can be a "stupendous artiste non-pareil". Can you be troubled to describe how Abhishek can lose himself in the "ruchi or the flavour of music along with his sparkling imagination" or also provide instances of who you believe is an artiste that has bloomed the way you opine? I'm going to skip the section on the violinist and jump straight to the last para about the mridangist (mridangamist?). A thani-avartanam provides the reviewer an opportunity to objectively review. The mridangam stays in the pocket of the beat, syncopates / goes off beat and / or crams a bunch of math. How did the mridangam sound? Was it a thugg kattai / etchu kattai? how were the chollus connected with one another? Again you provide no details. I am not going to assume anything about why your review does not go indepth. What I am going to assume is that you will be open to a discussion on how to write better review of carnatic cutcheris.